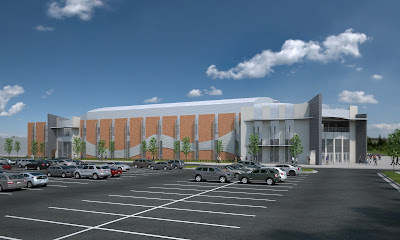 The architectural rendering from the CRSA firm of the Idaho Falls Event Center at Snake River Landing. The Idaho Falls Auditorium District unveiled its design Thursday for the 5,000-seat event center at Snake River Landing that it hopes to break ground on this fall or next spring. The design was the main attraction at a Grow Idaho Falls investors' breakfast, where Cindy Ozaki, who chairs the district board of directors, spoke about the project's progress. Although they had hoped to break ground this year, Ozaki said the board members want to be sure they have adequate financing in hand. "We're just moving very carefully," she said. Idaho Falls voters in May 2011 approved formation of an auditorium district that levies a 5 percent tax on guests staying at local hotels. So far, the district has collected more than $1.9 million. The overall cost of the project has been estimated at $30 to $35 million. In May the Auditorium District filed a plat and request for annexation with the city of Idaho Falls. Those have been reviewed by the Idaho Falls Planning Commission and recommended for approval. The matter goes before the City Council July 26, at its regular meeting. Once a plat is approved and land is annexed, developers can file site and building plans and begin work on the project. The plat for the 22-acre parcel includes a new road that would connect to Snake River Parkway. There will also be access to the center from Pioneer Road, which now goes under the Pancheri Drive overpass and connects to Utah Avenue just south of Wal-Mart. Ozaki said they have a commitment for a junior hockey team, with exclusive rights going to Elmore Sports Group, which also owns the Idaho Falls Chukars. Yeah, so first the groundbreaking was supposed to be early in 2012, then late in 2012, then in May, then this fall, and now next spring??? I'd be very surprised to see this thing ever get built. I bet special interest groups are funneling the hotel tax money away. If I had a time machine, and I was able to move forward 5 years to July 2018, I'd be willing to bet the cost of this "Event Center" that you could drive down River Parkway, and not see it there. So you apparently voted against it....The Event Center will happen and you have alot of nerve (but not enough to put your name) to insinuate someone is "funneling" money. You obviously know NOTHING about the people who are and have been working on this. There are few people with more integrity!!! Can't wait to go to my first party there!! Junior hockey will be almost as pathetic as the Chukars are. Enjoy the amateur slop. But that is what is great about amateur slop. They are terrible, which makes it highly entertaining. I love to go to a Chukars game and see a 14-10 score. I think the hockey team will be even better. There will probably be lots of great fights. Tasty. Great service. Perfect location to Downtown Marriott. Highly recommend for business if in town during the week. Very well said. These service are really amazing. I appreciate it for sharing them.I really appreciate this, thanks .for more information ti visit my site.